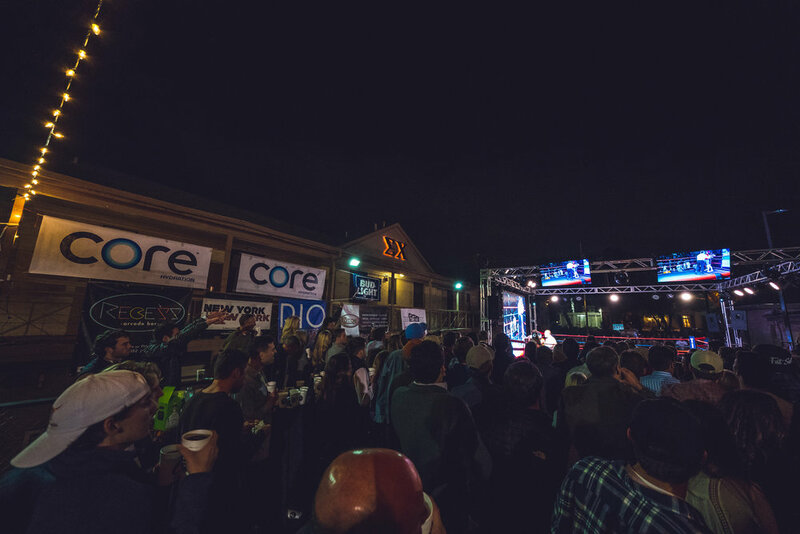 Sponsorship opportunities at Sigma Chi Fight Night provide a great chance for businesses to reach an appealing audience while simultaneously assisting in efforts to raise money for cancer research. Sigma Chi's chief initiative and principal purpose for putting on Texas Fight Night is to raise money for the Huntsman Cancer Institute. By supporting our worthy cause, sponsors are able to take advantage of a unique opportunity to help give back to the community while reaching a target audience. Your business can be the next lucky sponsor to advertise to thousands of college students! Since its introduction at The University of Texas, Fight Night has grown into one of the premier events of the fall semester. 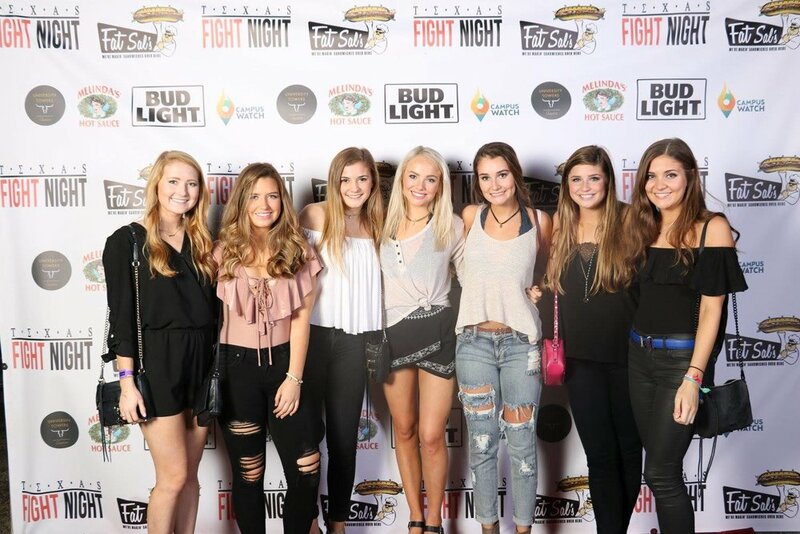 The 39th Annual Fight Night promises to be another chance for you to promote your organization or business in an exciting and positive setting for college students. From banners to t-shirts, your company has the unique chance to advertise at one of the largest student-run philanthropic events in Austin. T-shirts are just one way your organization can receive brand exposure from Fight Night. Each year promotional t-shirts are printed and distributed to guests prior to the event. Shirts from previous events are frequently spotted on campus and around the Austin community to this day. With this sponsorship opportunity, you can be sure your company's brand will continue to receive publicity long after Fight Night 2018 has concluded. Banners have proven to be one of our most popular advertising opportunities at the event itself. Patrons will see sponsors' banners displayed all around the grounds of the event including behind the boxing ring, above the VIP section, and on the chapter house. This is a valuable and unique opportunity to grow your brand recognition among a large audience of college students. Fight Night is a big event. And what's a big event without a red carpet? Our top sponsors (Gold Sponsors and up) will have their logo included on a step & repeat backdrop behind our red carpet entrance. This banner was first used at the 33rd Annual Sigma Chi Fight Night, and it was a huge success. After the event, these pictures were published all over the web by not only us, but by the attendees themselves. For weeks after Fight Night 2016, our top sponsors' logos could be seen all over Facebook and Twitter. That's a lot of exposure! Don't miss your chance to have your logo seen on the red carpet this year. The 39th annual Sigma Chi Fight Night presented by you! This package offers the most exclusive and comprehensive exposure. Banners will be strategically located in the most valuable positions around the property. Your name and logo will be featured prominently on txfightnight.com, on the 2018 Fight Night promotional t-shirts, and all over the event including the photo backdrop, video board, and as the announced host of the Title Bout (including a description of your company's services). Your banners will be placed above the boxing ring during the fights and the professionally produced musical performance at the end of the night. All eyes will be focused here throughout the event. This package includes hosting a boxing bout, a prime spot on the photo backdrop and promotional t-shirt, as well as two VIP tickets to the event. Your banners will be located near the boxing ring during the bouts and professionally produced musical performance. Your company will be the host of a boxing bout, and your logo will be included on the 2018 Fight Night promotional t-shirt. This package also includes two VIP tickets to the event. In place of your advertisement on a banner, your company’s name and logo will be displayed (with hyperlink opportunities) on the event’s website (txfightnight.com), which will be the official online source for all Texas Fight Night news and information. Logos will be included on the Fight Night promotional t-shirt. Two VIP tickets will also be included. Banners will be positioned in prominent places around our property, and your logo will be included on the 2018 Sigma Chi Fight Night promotional t-shirt. 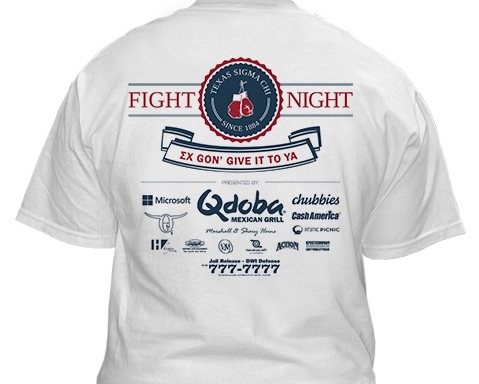 This package places your company's name on the 2018 Sigma Chi Fight Night promotional t-shirt. Banners and logo artwork must be provided by the sponsor. If your company does not own a banner or has some other form of promotional material, please contact us for further details. We understand how important you, our sponsors, are to the success of Fight Night. That's why we treat our sponsors like VIPs. Our Website Sponsors-and-up will receive two VIP tickets. The VIP tickets include: access to exclusive ring-side seating and viewing, an assortment of catered food, a private complimentary bar with premium beverages, and more.